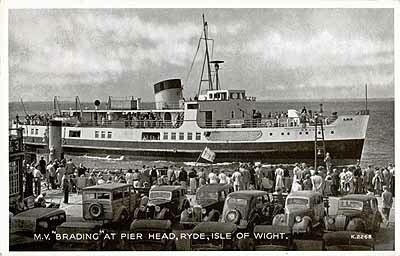 MV Brading passenger ferry was one of three similar passenger ferries used on the Ryde/ Portsmouth route - the other two were MV Southsea and MV Shanklin. There were built in Dumbarton to replace two paddle steamers lost during WW2 and came into service in the early 1950's. They were withdrawn from service during the 1980 when Sea Containers Ltd (who had taken over the route) introduced high speed Catamarans.